Lamb of God has been called a “Christian Rock Band,” fine by me. However, they are anything but Christian! 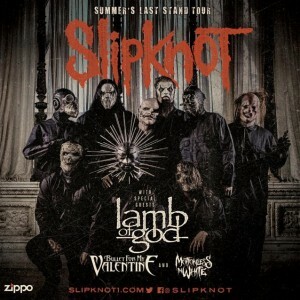 Lamb of God is touring with outstanding artist like Slipknot, Bullet For My Valentine and Motion In White in the music festival Summers’ Last Stand. There are definitely a couple of music genres in this tour, all Metal non-the-less. What sets apart Lamb of God from all the rest is their true American metal, with great set of drumbeats and amazing guitar riffs. There is no other American grown band that is doing what they are. Randy Blythe’s first gig after being released from prison has not being di sappointing at all. Live from Concord, California Lamb of God’s performance was on point. This band is tighter than before and their hunger for success shows on the stage. Heavy guitar riffs shriek on the pavilion by Mark Morton and Willie Adler, those cannons drummed on by Chris Adler, the bass power by John Campbell and of course the gory vocals by Randy Blythe. “Still Echoes” kicked in ravaging the Concord Pavilion as the band played their souls out. Images of buildings being demolished played in the back ground. During “512” fans were shown images of a teen bleeding and a girl consoling him as he choked on his own blood. Perhaps a depiction of what Randy Blythe might think happened to that one fan. The lyrics on that song are meaningful and the depiction of what it’s like to be between four black walls gives the feeling of pain, desperation and sorrow. Another great song that was played was “Ruin”, an imagery of what religion can do to those out there that worship and self-destruct for some belief. The fans were energetic and the pit was devastating. Lamb of God has fans that can withstand powerful shoving, and countless crowd surfers. Some fans would chant Chris Adler’s name while others would scream Randy Blythe. The fans never missed a word of the lyrics to any of the songs, and they were swaying side to side shoving and pushing each other to enjoy the heavy metal Lamb of God distributes. Chris Adler would drum with passion as he would head bang his hair, while both Mark and Willie move from side to side of the stage playing those alluring heavy metal riffs. What else can you ask from a heavy metal force that is Lamb of God? Nothing but the best. The tour runs through September 5th. Tickets at Live Nation.